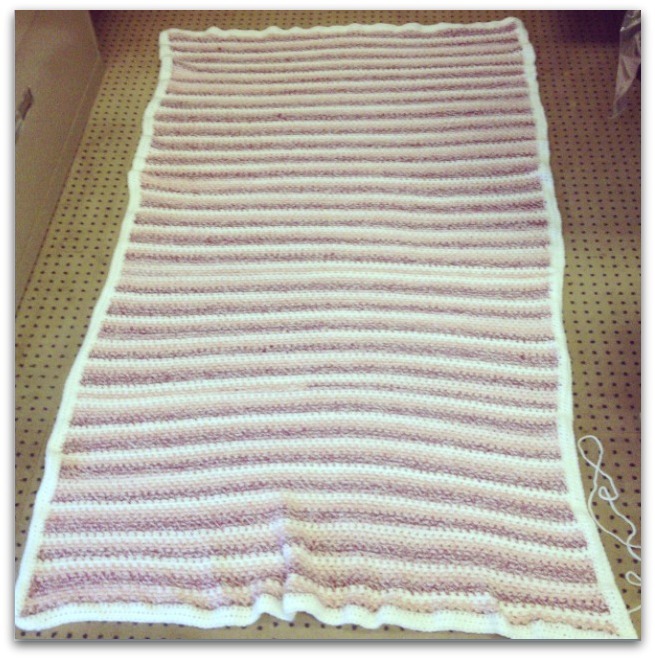 Well done on your blocking success, it does require lots of pins and patience but is always worth the effort. 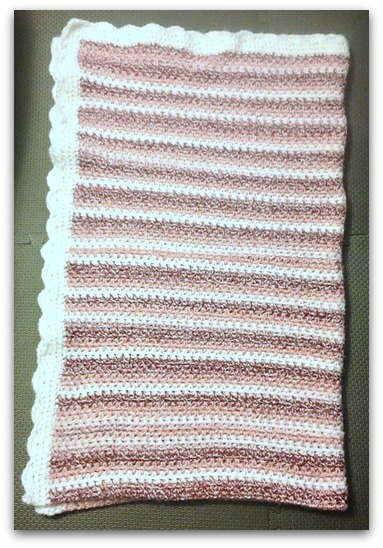 Your blanket looks fab. Thanks! I did use a ton of pins–I think about 46, and I would have used the other four in the pack if I hadn’t misplaced them. By the time I found them, I was so done, ;). Congratulations on the terrific blocking job. YAY! 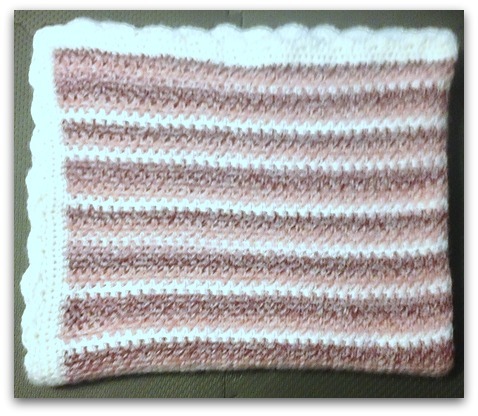 I have a crochet suggestion – something you might like to try when you start your next blanket. Instead of working into what’s thought of as the ‘top’ of an extra loose starting chain, you could try working into the back or spine of a regularly crocheted one. I call it a ‘spine’ because that’s what the line of single strand bumps on the other side looks like to me. I find it’s much easier to get my hook through those than the double strand on the front and there’s the added benefit of having the beginning edge of your blanket look just like its ending! Thanks for the suggestion, Linda! That is how I usually work into the chain, because I find going into the top too difficult. I just have a tendency to make my chains a bit too loose, obviously. But I am still learning quite a lot about crochet–because I am somewhat obsessed and I crochet so much, I have to remind myself I’ve only been doing this really for about 2 years, and I am still refining my technique, ;). Also, thank you so much for the compliment–it means a lot from someone who does the beautiful work that you do! 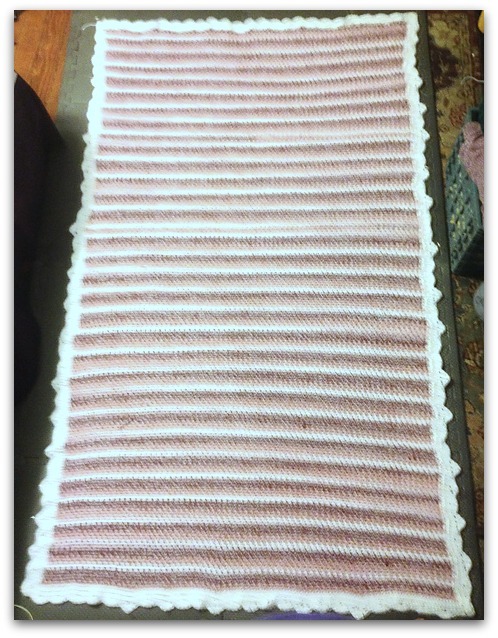 You do beautiful work, Susan, especially considering how new you are to crochet! Aw, shucks. Now you’ve gone and made me blush! Thank you. Linda, that is a great idea–I could use a smaller hook for the chain and the first row, then switch to the hook I want to use. Working into the chain is where I get into trouble–I make it so loose because I know it is hard to get in there, so the first row in the chain is where I really go wrong. It drives me crazy that the beginning is so bad when I am very consistent once I get going. Thanks for the great idea!